It was on the last development that we started to see an opportunity in the form of service industry workers who have a lot of trouble changing out their shifts. This primary use case, allowing service workers to easily get their shifts covered in a way that fits into their existing workflow, is a niche in which we have seen the most traction. Enter OK Shift, which we soft-launched a couple weeks ago and have been beta testing in several locations around the country. 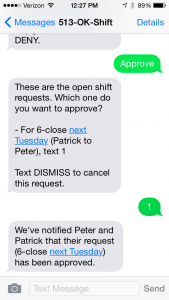 OK Shift is an SMS-based, cross-industry scheduling tool that lets hourly service industry employees get shift coverage, secure manager approval, manage their schedule and communicate with their coworkers. 59% of American workers are paid by the hour. There are 4.5M food and beverage service industry workers alone in the US, and millions more service jobs in other fields: transportation, hospitality, and medical care. It’s a gigantic market. Moreover, the technology that almost all service workers use to manage their last-minute shift coverage run-of-the-mill text messaging. Not everyone has a smartphone, but everyone has an SMS-enabled cell, and anyone who has worked in the service industry will tell you that the only way to get shifts covered is to text or call coworkers on an individual or case-by-case basis. The best part about OK Shift is that it’s free. Signing up is easy. If you work in the service industry, simply text HELLO to 513-OK-SHIFT (513-657-4438) or visit 513-ok-shift.com. Why did we decide to ultimately pivot away from ReservationHop? It became clear that the marketplace amongst restaurants wasn’t as big as we had hoped, for a couple reasons. First, after personally speaking to many of the best restaurants in San Francisco, as well as elsewhere, we could see that the value add we were bringing to the table wasn’t compelling enough to inspire a change in behavior. There was a real hesitance on the part of restaurants to mark up their prices in the form of paid reservations, for fear that they would lose control over dictating the value of their product. And there were, of course, branding concerns for many restaurants beyond simply maximizing revenue. And finally, there are only a handful of restaurants where consumers are willing to pay for a reservation. Of these, we could only provide a niche service for certain prime times or weekends. In order to build a long-term sustainable business, the market would have to expand significantly beyond exclusive restaurants. As I wrote in the past, we set out originally to work with restaurants and that’s what we intend to do as we evolve into this latest iteration. The past couple of months have been extremely educational and I am excited to move forward with OK Shift. We have spent the time to build and ship a researched, well-considered and tested product that we believe will solve a giant pain amongst a huge portion of the population. ReservationHop was an experiment, and an important stepping stone in building a sustainable business. Now, as we move forward as OK Shift, the sky’s the limit. The idea was simple: why isn’t there a good system for hourly workers (60% of the US workforce) to swap their shifts out via text message? 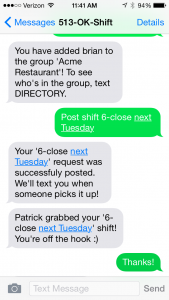 Enter OK Shift, a text message-only based system that allows hourly workers to swap their shifts via text message, and get those swaps approved by managers. The system allows for shift management, directory management, the ability for managers to call off a shift or call in workers, and more importantly to communicate with the entire team at once via group chat. It all works by texting the number 513-OK-SHIFT (513-657-4438) and the system prompts you through the rest: posting shifts, adding coworkers, adding managers to approve, and broadcasting. On the technical side, it uses the Twilio API with a PHP/MySQL backend (like all my projects). It’s free for now, but eventually I want to add a paid scheduling layer on top of the system for management.